Can I work with Dr. Freedman? Dr. Freedman works with a limited number of students each year. Please contact us if you are interested in working with her. I am a pretty strong candidate. Do you only work with "borderline" applicants? We work with many exceptional applicants who are vying for spots at the most prestigious medical schools in the country. MedEdits can offer such students a distinguishing advantage over the competition. Yes! Flexible payment plans are available for all packages. Contact us (646-217-4674) for details. What if I need to get in touch with you? We pride ourselves on offering excellent service. If you need us, pick up the phone and call us, send an email, or visit our website for an online chat. We know that the medical admissions process is stressful, and we will be available when you need us. Call us by phone at: 646.217.4674, email: info@mededits.com, use our website chat, or use the contact form here. Can I choose whom I work with? Yes! However, we function as a team at MedEdits. In this way, you benefit from each member’s unique expertise and perspective and our collaborative efforts. Can parents/significant others be involved in the process? Sometimes, parents or significant others listen in to our initial Game Plan session but only with the applicant’s express permission. After the Game Plan session, all work and communications are between MedEdits and the applicant, exclusively. Will you work with nontraditional applicants and reapplicants? Absolutely! We work with both “nontraditionals” and reapplicants. If you are a reapplicant, we will analyze your previous application(s) as part of your Game Plan session. I am anxious about sharing personal information. Is what we discuss confidential? Everything we discuss is 100% confidential. We never share information. The more honest you are with us and the more we know about you, the more we can help you. If I purchase a package, can I upgrade? You can upgrade your package once within three months of purchase. After one upgrade, all services must be purchased a la carte. If I want to get a great residency match, when should I start working with you? Some clients start working with us in early in medical school. Others start working with us late in the third year of medical school or early in the fourth year as they get ready to apply for residency. If I want to go to medical school when should I start working with you? As soon as possible. 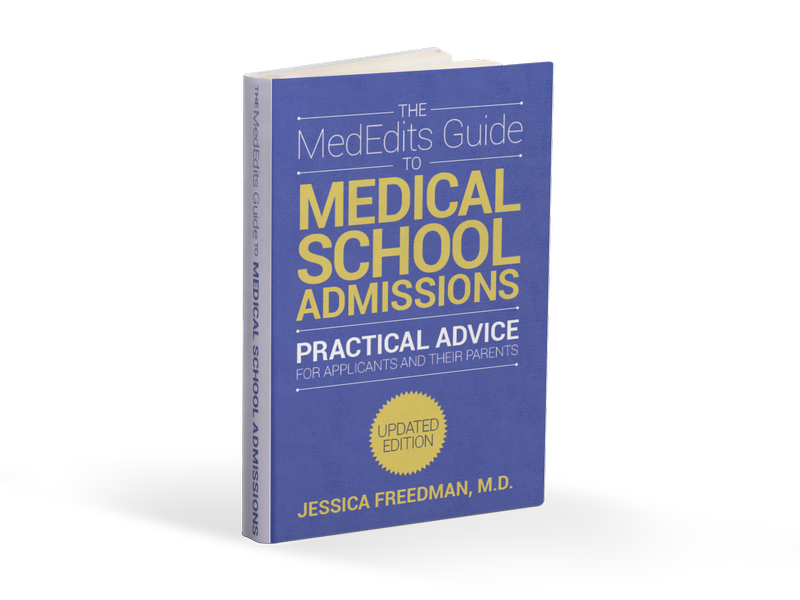 Some clients start working with MedEdits before they start college so they have clear idea of what they need to do to be competitive for medical school. Other applicants start working with us during the medical school application year. Yes. We offer free 15 minute consultations. Most of our clients start working with us by having a Discovery Session when we review your overall candidacy and come up with an overall plan for your success. However, applicants who are in their application year might start working immediately on documents by purchasing document editing. If you aren’t sure which option is best for you, please contact our office. Do you offer any guarantees? What is your success rate? We do not offer any guarantees or promises. While our success rate is impressive, some candidates simply are not competitive for medical school / residency admission. That said, clients who have worked with us comprehensively on every “piece” of the admissions process do very well: 94% of our comprehensive medical school applicants are accepted to allopathic medical schools in the United States and 100% are accepted to osteopathic medical schools. Similarly, 100% of our comprehensive residency clients match in the specialty of their choice – many to their top-choice programs. Past performance does not guarantee future success rates. What if I want a combination of services that isn’t listed on the website? We are happy to create a custom package. Just let us know what services you want, and we will offer you a quote. How long is the editing process from start to finish? In large part you determine how long it takes for your documents to be ready for submission. Because we offer detailed commentary on how to improve document content, many clients spend up to a week working on each draft after reviewing and incorporating our suggestions, but others can return drafts to us in 24 hours. What is the document editing turnaround time? We guarantee that each document revision will be completed in no more than five business days. If you need a shorter guaranteed turnaround time, please contact us. Will you write my documents? We are sorry; we will not compose documents on behalf of clients. All editing takes place via email. We use the “track changes” function of Microsoft Word to edit documents and the “comments” function of Microsoft Word to make written suggestions. When we edit, we don’t do only “the basics,” such as correcting your grammar and spelling; we also make in-depth and detailed suggestions about what topics and ideas you should address in your written work. We get this question often. Please visit our “Why MedEdits?” page for the answer. Can I work with you if I don’t live near your office? Yes! We work with applicants from all over the United States in a variety of time zones. This is part of the reason we have a broad knowledge base of colleges and medical schools throughout the country. Did not find the admissions answer you are looking for? Ask a question and receive a prompt reply. Visit our contact page and send us a note. Click here.